The books from National Geographic never cease to amaze me, and this book is no exception. Beautifully bound and hard-covered, Odysseys and Photographs is another example of book publishing done right. At 10×11″ there’s plenty of room for big brilliant photographs. And the content of this book is something special. It’s a collection of amazing photographs from four historic storytellers, and many of the images have rarely been seen outside of the National Geographic archives. The four photographers featured in this book exhibit a collective work spanning most of the 20th century. Not only is the work extremely artistic, it’s also historic and serves as a permanent record of the World’s past. Odysseys and Photographs (ISBN 978-1426201721) can be purchased directly from National Geographic or through Amazon.com. DISCLAIMER: This is NOT a paid review, nor has it been reviewed or edited by the book’s author or publisher. The book was sent to me by the publisher free of charge. I am in no way affiliated with the book or the publisher of the book. Odysseys and Photographs is a hard cover 10×11 inch publication with 224 pages containing 200 photos in both black & white and color. There are four main sections of the book, each covering a written introduction and a set of photos from the four photographers featured (see below). In addition, there’s an overall introduction by Gilbert Grosvenor and an Epilogue by Sam Abell. 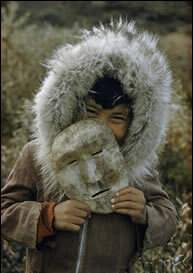 The photos contained within the book take us through a journey of time and history across the globe. Although the imagery may seem foreign to us as present-day viewers, we have to realize that many of these are photos of real life and regular people. I often forget that every corner of the world is so different from my own, and this book is an awesome reminder of how diverse and rich our planet really is. The locations and subjects photographed in this book are too numerous to list. But a few of my favorites include: Williams’ photos from India, Greenland, Syria, and Afghanistan; Marden’s photos from St. Lucia, Nicaragua, Argentina, Tahiti, and the United States; Wentzel’s photos from the Eastern United States, India, and Italy; and Abercrombie’s photos from Alaska, Japan, Egypt, and much of the Middle East (in stunning color too). 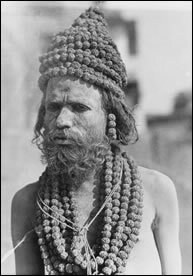 The four men featured in the book were more than photographers — they were pioneers, teachers, and friends of the world. The legacy that each of them has left behind is truly awesome. 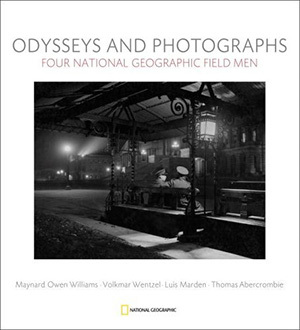 Maynard Owen Williams (1888-1963) was a National Geographic field correspondent from 1919 to 1953. Williams is often attributed with being a part of the group of photographers who invented the personality of National Geographic. He had a way of becoming intimate with his subjects, and this is apparent by looking at the people in his photos. Volkmar Wentzel (1915-2006) was a National Geographic field correspondent from 1937 to 1985. 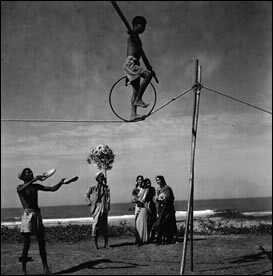 Wentzel extensively photographed Asia and Africa as well as many other parts of the world. He had a strong passion for the preservation of historic photographs. Odysseys and Photographs is a wonderful collection of photos from an equally wonderful collection of photographers. The book is a tribute to these four men and all the passion they put into their work. Each page offers something new and exciting, with a mere 200 photos covering so much of the globe. The book is also a piece of history, and some of the places photographed have either been permanently changed or completely destroyed since the photos were taken. It’s hard to come up with any negative thoughts on the book. I typically enjoy a little more information or background on the photos in these types of books, but such a thing would be understandably difficult due to the circumstances. Nonetheless, the brief biographies prepare the reader for the photos that follow. This is another fine photography book from National Geographic, and I would recommend it to those who love photography, art, history, and world culture. This entry was posted in Features, Reviews and tagged art, book, book review, foto, national geographic, photo, photography, photos, review on November 22, 2008 by Brian Auer. There are a couple more on the National Geographic site (if you click on the book cover in the article, it will take you there). Or, if you live near Washington DC, you can see a selection of 65 images at the National Geographic Museum until January 4, 2009.